(TB2QA8Z) Look Twice Geocoin - Todie's Wild Ride: Don't say you can't see us! Todie's Wild Ride: Don't say you can't see us! In the hands of yingyang97. Use TB2QA8Z to reference this item. Please keep me moving, I have an important message to share! Be aware of bikes around you, the person on that bike is someone's husband, father, son, brother, sister, mother, daughter, wife, LOVED ONE! Help them stay safe so they can spend tonight with their family. Gallery Images related to Todie's Wild Ride: Don't say you can't see us! Being a native Cali girl myself, we would love for our coin to travel from CA to FL. We live about an hour away from Orlando, so maybe we will be able to sneak over and catch a picture with the coin before it continues on its journey to raise bike awareness!! Will be taking this coin to the Disney World area of Florida if the owner doesn't object. 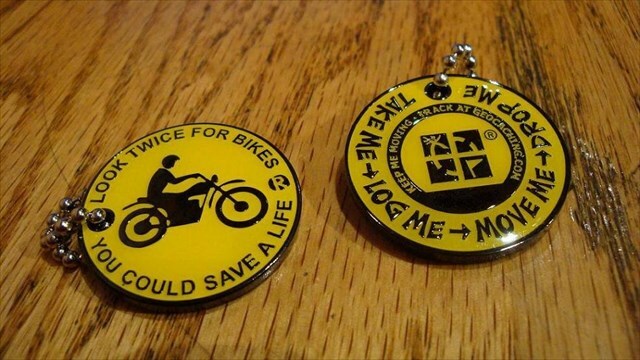 We always watch out for bikes as we are bikers. One thing we might add....Bikes also have loud pipes for a reason, you may not see them but you will probably hear them. As the saying goes, "Loud pipes save lives". Will move on soon and will watch out for motorcycles.